On April 6, 1917 the United States officially joined the war in Europe. 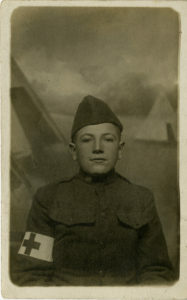 During the Great War over 122,000 Wisconsin men and women served on land, sea, and in the air. Unfortunately, many people alive today never had the opportunity to meet or talk with a World War I veteran and many of the personal stories have been lost to history. 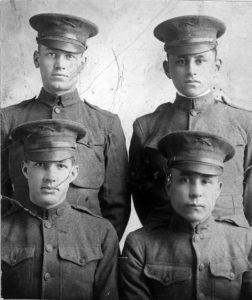 The Wisconsin Veterans Museum takes great pride in its collection of World War I oral history interviews, and we are pleased to share these interviews with the public. This is a rare opportunity to hear the stories of these veterans, in their own voices, with their own words. 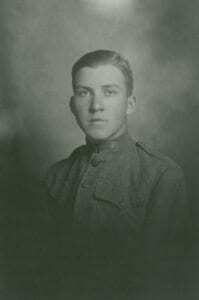 Please click on the links below to access the stories of World War I veterans through the Oral History Metadata Synchronizer (OHMS) tool, courtesy of the Louie B. Nunn Center for Oral History, University of Kentucky Libraries. You can watch the videos, search the transcripts, and review an index (some including photographs) for each interview. Before you click! Be advised, these interviews may contain potentially disturbing content related to combat as well as sensitive material relating to PTSD and moral injury. We appreciate the bravery of the narrators in sharing their stories—please be respectful when engaging with these interviews.